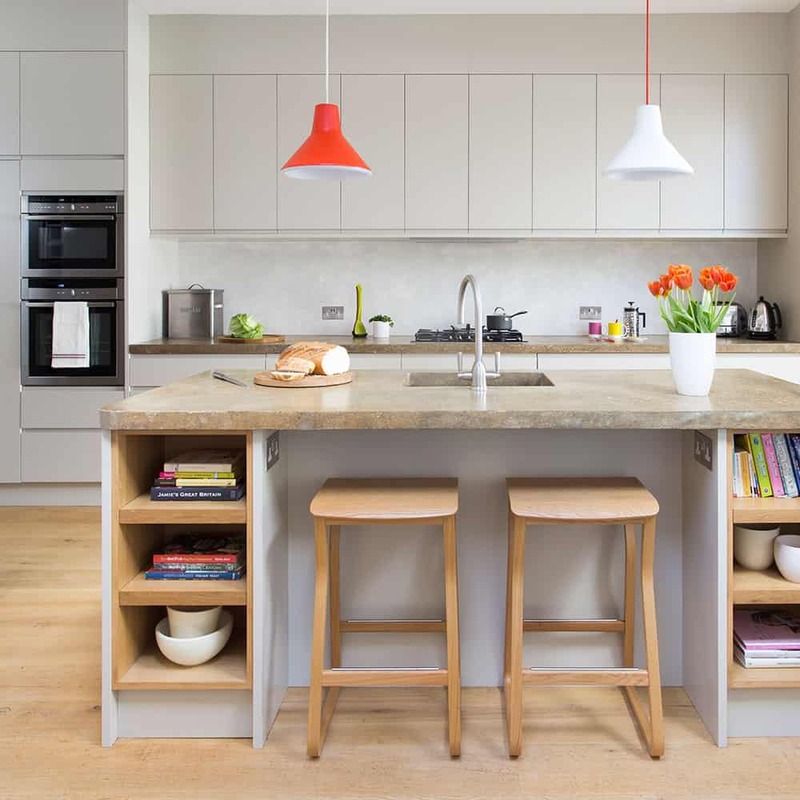 Style and décor know no boundaries, yet it can become a bit overwhelming when you’re working with a smaller room particularly a smaller kitchen. 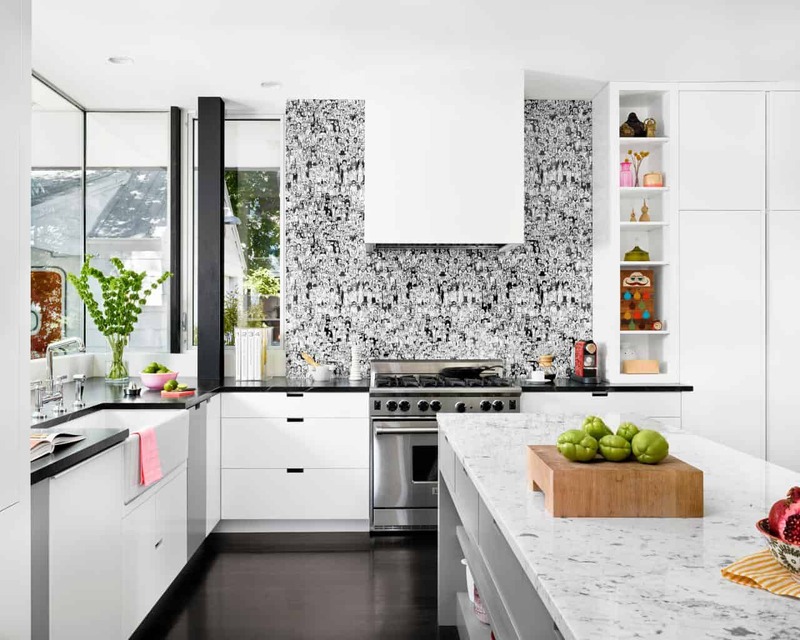 While most rooms can be reorganized and adjusted to your liking, when you first take a glimpse at a smaller kitchen you might become a bit discouraged due to not knowing how to decorate the space. 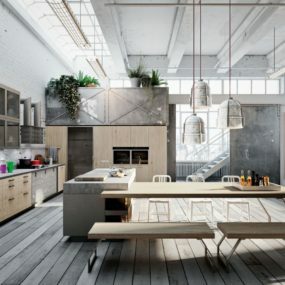 However, if you have a tiny kitchen here are a few examples of how to fall in love with the space. 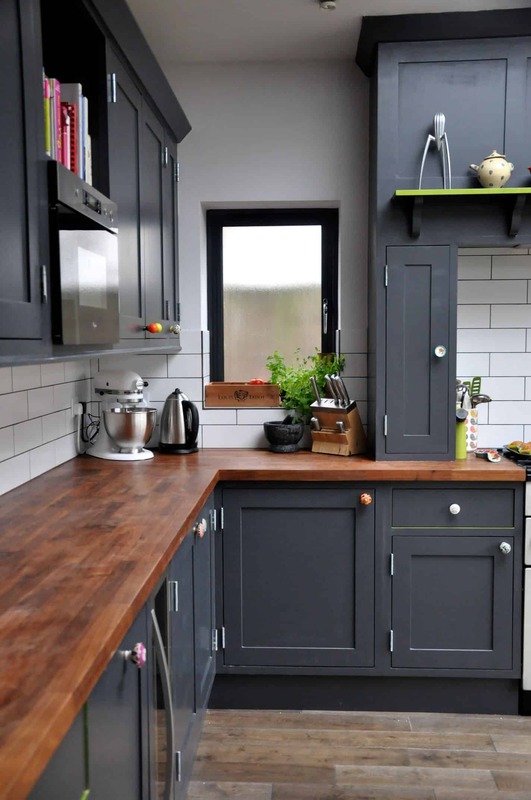 Charcoal gray is such a pretty, elegant color that it will also work well with wood bits that add a chic rustic twist to the kitchen. 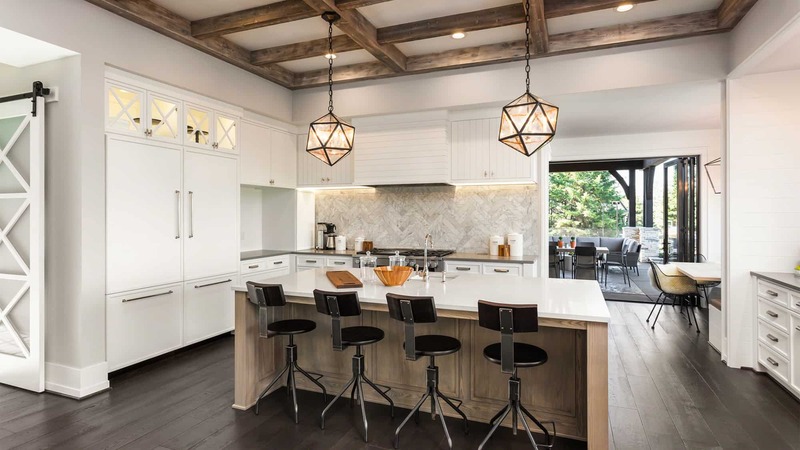 While darker colors might seem intimidating for a smaller kitchen, they can be the complete opposite when they’re paired with lighter hues that brighten the space. 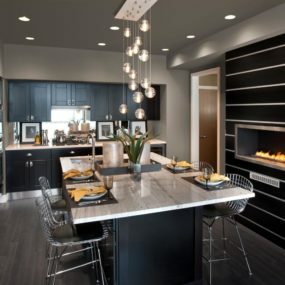 Consider a color such as charcoal gray, this hue is rich and bold but when it is paired with a marble island the hue seems to come to life in the simplest manner. Therefore, have darker hues around the border of the kitchen and brighter ones in the center. 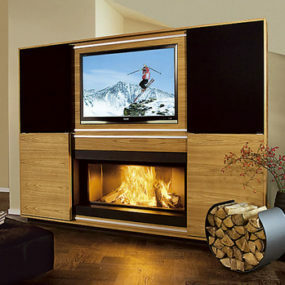 Concealing your appliances can create an immediate larger feel to the room. Not only that but the room will feel grand and modern. 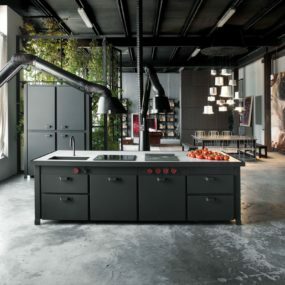 The latest kitchen trend on the market right now is truly taking over- concealed appliances. For a smaller kitchen conceal your appliances and allow the size of the room to make the big statement. Instead of having your metallic appliances be the main focus the airiness of the room will be instead. 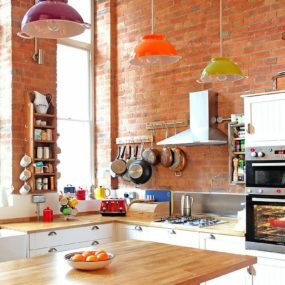 Not fond about adding too much color or texture to your kitchen? Go for a rich backsplash, even with neutral hues for that stark bit of character. When in doubt, trust the color. 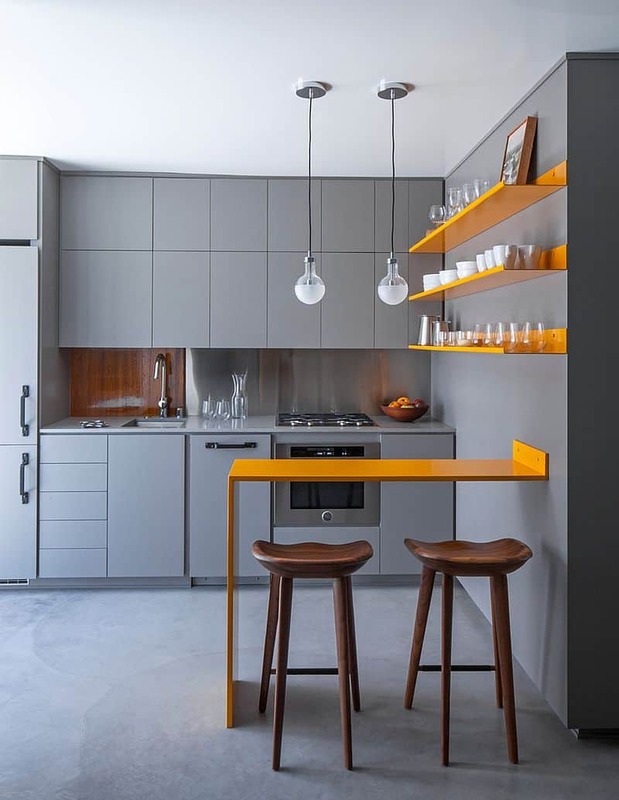 If your kitchen seems a bit “too” small color is the way to go. 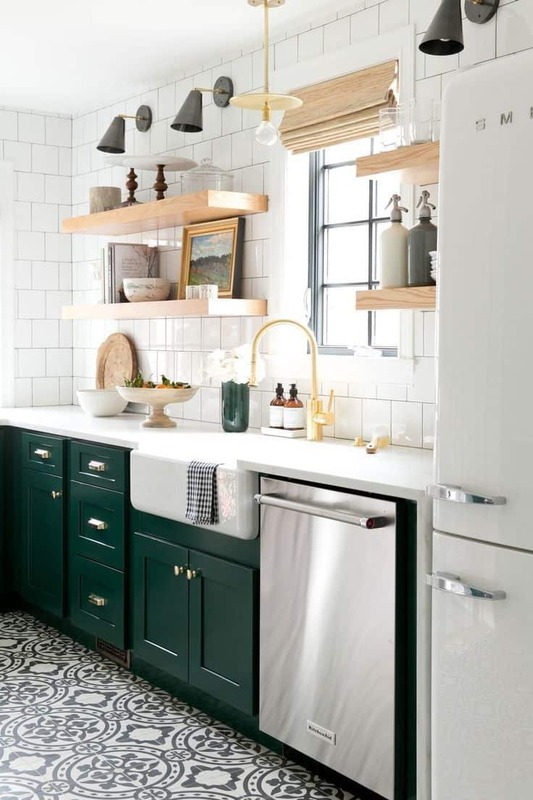 Go for a tiled backsplash with bold hues of color or even a daring wallpaper that comes with everything you need to bring the room back to life with little to no additional decorative bits needed. You could even have fun with the flooring as well. Have fun with your tiles to bring direct focus exactly where you need it. The more color you bring to your flooring the easier it will be to decorate around it. As mentioned above, consider going bold on your flooring instead. 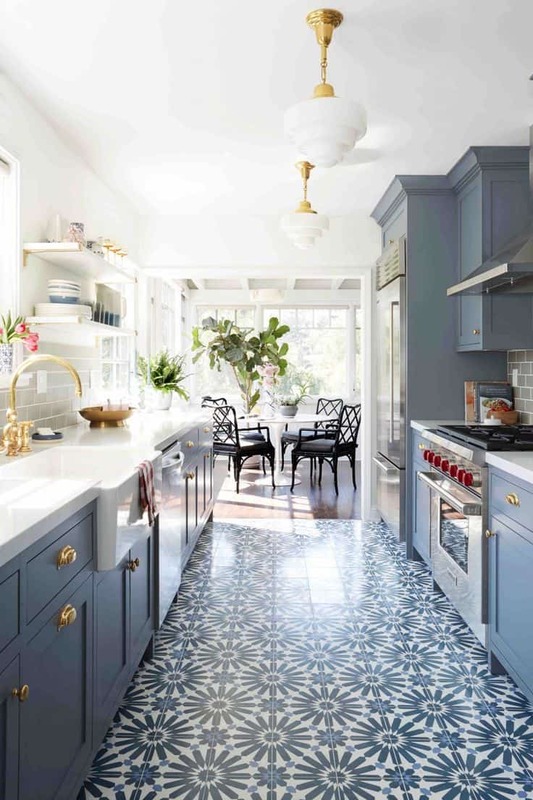 If you are dying to try a bold color in your kitchen that will make it feel grand and open, yet don’t feel you have the space for it, your floor is the perfect way to go. You have enough space on the floor to choose different colors, patterns, and tiles that coordinate with the décor you already have. Bring on the open shelves to transform your kitchen instantly. Keep them simple and only display what you need for the best outcome. Small kitchens typically come with little to no cabinet space and if they have extra cabinetry those are traditionally too big, or they take up too much. In order to remove the bulkiness, most cabinets add consider an open shelving system. The open shelving will remove the heaviness of the room and bring a seamless airy feel. 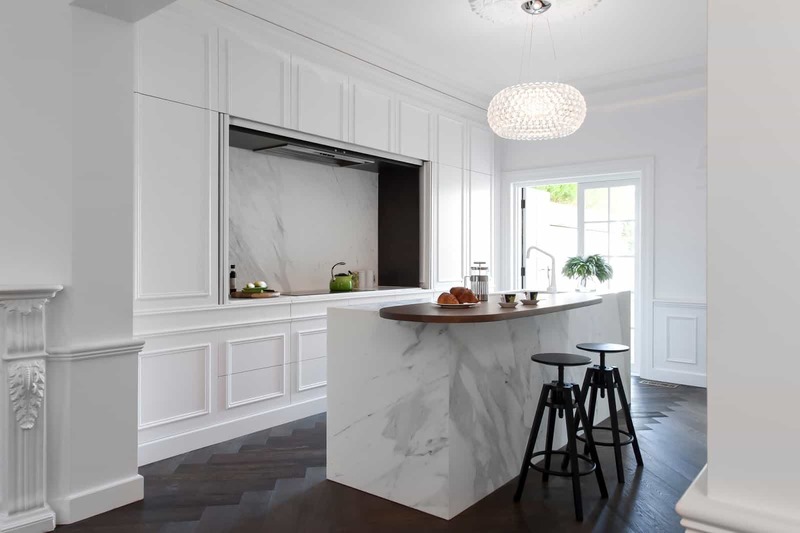 Whether you have a long kitchen that is small or a narrow kitchen, using an all-white display is the perfect way of bringing beauty and making the space feel larger and more put together. 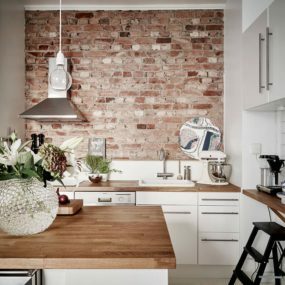 Nothing has an expanding feel in any room quite like the color white; therefore, when in doubt of how to fall in love with your small kitchen go for an all-white design. 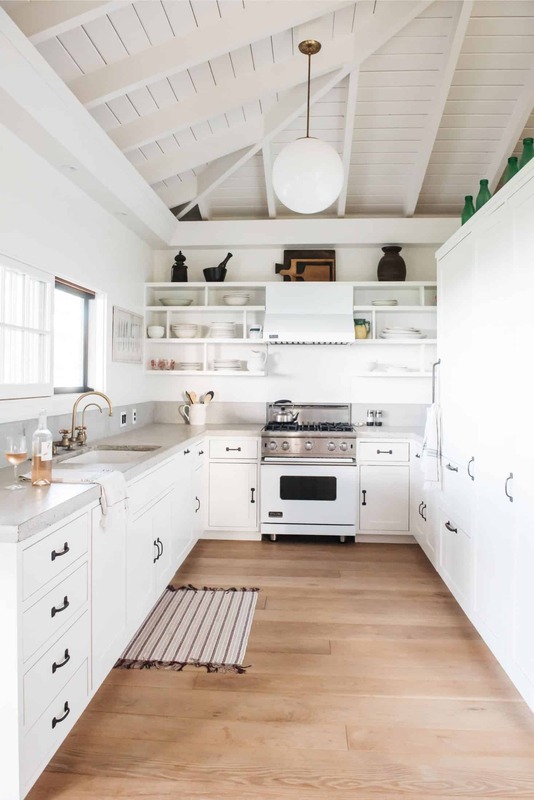 An all-white kitchen will feel grand and open while embracing the size of the space. Think of it as the perfect way to make your room feel twice its size. 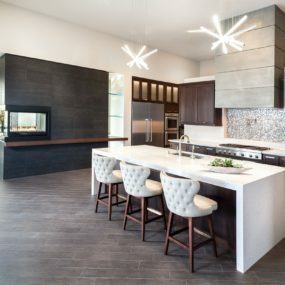 Unique lamp fixtures might be difficult to find but they make a huge impact in any room, particularly in the kitchen. Add two of the same light fixtures to make the biggest impact. We can never emphasize enough how important having bold light fixtures is, particularly when you’re focusing on decorating a small kitchen. 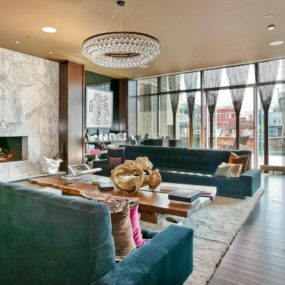 Light fixtures make a tremendous difference in how large the room looks and feels. You could even say they are what make or break the room. Add multiple light fixtures through areas that need brightening to naturally enhance the room. Add an island that has storage for that classic appeal that helps keep the room organized without having to add any new bits of furniture. Do not shy away from your kitchen island as it actually is your friend. The island can make a kitchen feel more put together and essentially bring a naturally “homie” feel to the room. The key is having an island that is proportionate to the room, the island shouldn’t take away from the space or feel as if it doesn’t belong, it should feel seamless and cohesive as if it was there. Have your island not only double as a storage collection but as a breakfast bar as well. Doing so will knock two things out the way without having to add additional decor. 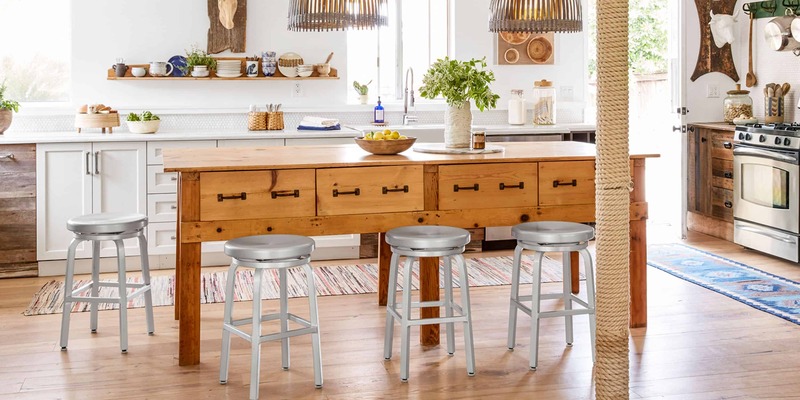 The best thing you can do for your kitchen is adding in multipurpose furniture, it will save you space while making the room feel put together. Furthermore, you will have everything in one room without having to compromise. The key is keeping it simple and adding those key bits that make the room feel grand while having a simplistic effect. For an accent color, you want to go bold and fun such as a pop of yellow, red, or even a pop of blue. These colors add a vibrant appeal that is still warm and open. For small spaces having vibrant accents is the key. Furthermore, it brings the room back to life while making the space have texture and character. Contemplate having bits that are vibrant to bring beauty back into your space while still being simple and cohesive to the room. Tiny kitchens are our top favorite but decorating them is not quite as fun. Which of these will you be trying? Please let us know below.